Esther Mae West Harris, daughter of the late Tilman P. and Annie R. Lynch, was born in Essex, North Carolina on February 4, 1927. She left this earthly realm and ascended back to God on August 4, 2018. At an early age she was baptized and joined Pine Chapel Baptist Church in Hollister, North Carolina. In later years she relocated to Franklin County and joined Saint Hope Missionary Baptist Church. She recently reclaimed her faith at For Your Glory Ministries International in Louisburg, North Carolina. She lived a long and happy life. She loved taking care of people, watching westerns on television, and putting a smile on everyone’s face. She truly lit up each and every room she entered. In 1982 she was united in holy matrimony to the late Joseph E. Harris who preceded her in death. She had one daughter, Penny Ray Norris and one granddaughter, Joyce who also preceded her in death. 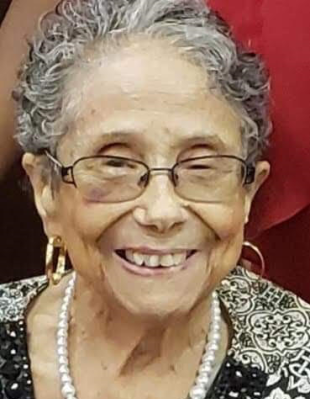 She is survived by one granddaughter, Cathy (Jerome), eight great grandchildren, twenty-five great great grandchildren, two great great great grandchildren, a host of nieces, nephews, other relatives and friends.